Does anyone have any suggestions for handling the photos they take? Do you keep them full size on your computer or resize them? Once resized, do you delete the originals? Once used, is it safe to delete them without negatively impacting your blog? Okay, here's what I do. I shrink my pictures for my blog, but I do save the originals. Several times local businesses have asked to use a picture I've taken, and that way I have an unedited version if they want it. But - every six months I move ALL my photos to my external hard drive, so they don't take up space on my computer. An external hard drive has TONS of space. They cost about $120 to get a nice sized one. I got mine at Best Buy. I do the same thing Lisa does. I resize for the blog but I keep all my originals and they are stored on an external hard drive. You can delete pictures from your computer without it being erased from your blog. Once you upload it to your blog it's stored in your web album. I cull regularly, maintain them full size and save them to an external drive for backup. Looks like you got your ? answered. Very atmospheric collage! I a like Sandra. I do not mess with the size, it works well on blogger just the way it came from the camera. Then I have dozens and dozens of folders in my Picture Gallery. Like flowers, animals, circus, family, birthdays Etc. Love the moon shots! As for storage, I will resize if necessary and rename to preserve the original. Then I can store stuff on various thumbdrives I have, or upload to photobucket.com and use their free storage space. For prints I like Shutterfly.com myself. I leave my photos on the computer for a while but, every so often, I put them on my external hard drive and delete them from the computer. I also use DropBox, though this is very recent, and Shutterfly. Oh, and Smilebox. Love your shots! 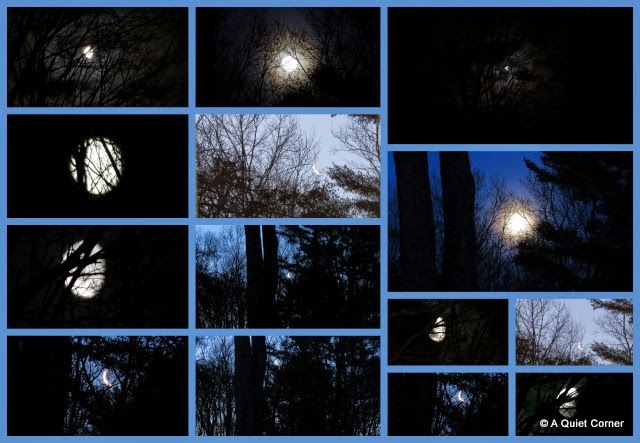 Wonderful photos of the moon! I resize also the photos for the blog, and keep the original (save them to folders) - and every now and then, move them to an external harddisc - and delete from my pc.